Summary: When Empire Oil comes to Ashley’s Northwest Territories community intending to drill, Ashley takes extreme action to prevent them from following through and wrecking the land. Afterwards Ashley’s drumming group is invited to play at Carnegie Hall in New York, and Empire Oil’s willingness to pay the cost of their travel puts Ashley on edge. Turns out Jack Masters, vice-president of Empire Oil, has a secret agenda to save the world from Climate Change in a radical manner that involves Ashley, and she and her friends find themselves on an unexpected journey that could mean the end of all life as they know it. Review: In the sequel to On Thin Ice, Ashley is as staunch in her fight against Climate Change as ever. But now she’s fighting a big oil company in an effort to save her community and their way of life as much as she can despite the changing environment. What follows is an unexpected adventure – Ashley’s drumming group is invited to play in New York where Ashley meets Jim Masters, an oil man himself who asks her to speak at the United Nations. An eccentric with his own personal grief issues, Masters is a puppet-master working everyone’s strings in a plan that is both admirable and vindictive. I had trouble keeping up at times with everything that happened, but in the end I could see the bigger picture which I appreciated. My favourite character in Bastedo’s sequel is Sila, also known as Earth. She’s someone who should be respected and often isn’t, but I grew to enjoy how Bastedo paints her as vengeful and intentional in her actions. I don’t think she meant to kill Ashley’s dog, but I do question the randomness of the rain during the concert. Personalizing Earth’s actions gives her depth, and made me think twice about how Earth would be treated if she were a person instead of a planet. Bastedo makes a valid point with his story by opening up the conversation about how badly we treat the place where we live. Sila’s Revenge is a stand alone, informative read about the subject of Climate Change, but since it’s more action based reading On Thin Ice first greatly helps develop Ashley as a character. I’d recommend it for fans of William Bell’s writing. “The world had a beginning called the Mother of All Things. Once you have found the Mother, you can know her children. Having known the children, hold tightly to the Mother. “‘You may think I’m crazy but I love the cold. I have to laugh when I walk these streets. It’s barely cold enough to snow and New Yorkers are bundled up like it’s forty below. For us, cold isn’t some pain to ruffle our hairdos. It’s not something to get over with like the flu. Cold is something we celebrate. It defines our land, our culture, who we are. This may sound funny but we can’t live without cold. 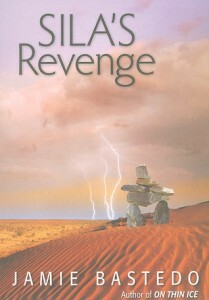 Sila’s Revenge by Jamie Bastedo is published by Red Deer Press, (2010).